Today I have a little announcement: Sophie K. proudly presents her very first indie ebook and first story in English: the medieval short mystery »The Clay Doll« is now available on the Kindle and Kobo ebook stores. The story takes you to medieval Cologne in the year 1215. After her father’s death, Agnes is urged to get married. The carpenter’s workshop needs a new master, the family a man in the house, and Gero, the assistant, will be a good husband. But Agnes’ heart is not in it. Her brother Simon is meant to be the heir. What happened to him, since he left for the Holy Land? Day after day Agnes hopes for his return, wondering: why did he take her clay doll with him? It is a question Agnes cannot let go of. The story was first published in German in 2009 in a collection of mystery and murder stories set in Cologne. I really like it, if only because of the huge effort of writing it. Plotting even a simple mystery isn’t simple at all, and then there’s the medieval setting: what did Cologne’s streets look and feel (and smell) like in 1215? What happened when the master of a workshop died without a male heir? Did people actually keep dogs in their yards at the time? The boy Nikolaus, whose charismatic speech Brother Carolus recalls in the story and who inspired Agnes’ lost brother Simon, is mentioned in historical sources as the leader of the pilgrimage which later became known as the »Children’s Crusade«. None of those who followed Nikolaus — not only children, but also unarmed men and women, peasants, clerics — ever reached Jerusalem. For most of them, it was a straight road to death. Some ended up in slavery, some survivors went to Rome, begging the Pope to let them take back their crusade vows. And those who made it back home faced the ridicule of their neighbours. Cologne Cathedral (Kölner Dom) — that stunning gothic landmark at the heart of the city today — didn’t exist at the time of the story. But Agnes would have known the previous, pre-Romanesque building, which was demolished in 1248 to make room for the new cathedral. From descriptions and excavations lots of details are known about the »Old Cathedral«, which Agnes enters seeking shelter on a rainy day. This drawing (copied from an old chronicle) gives an impression of the former church. Last, but not least: the clay doll itself. I found pictures of figurines from later centuries; this is roughly what »Flower Mary« in the story may have looked like, though 13th century clay dolls would have been modelled by hand (rather than from a mould) and perhaps be a little less detailed. There is no direct model for the »Flower Mary«. When you read the story, you’ll find out why there couldn’t be a photo of her today. 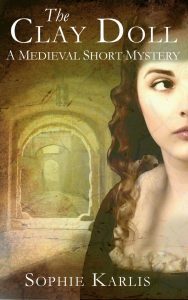 »The Clay Doll« is a quick and suspenseful ride to medieval Cologne. The short mystery has about 25 pages, you’ll be back in thirty minutes. When you are, I look forward to hearing what you think! I also set up an English mailing list: if you sign up, I can send you a message as soon as I have a new English story ready for you.